A method is presented in this paper for answering location-dependent queries in a mobile computing environment. We investigate a common scenario where data objects (e.g., restaurants and gas stations) are stationary while clients that issue queries about the data objects are mobile. Our proposed technique constructs a Voronoi Diagram (VD) on the data objects to serve as an index for them. A VD defines, for each data object d, the region within which d is the nearest point to any mobile client within that region. As such, the VD can be used to answer nearest-neighbor queries directly. Furthermore, the area within which the answer is valid can be computed. Based on the VD, we develop a semantic caching scheme that records a cached item as well as its valid range. A simulation is conducted to study the performance of the proposed semantic cache in comparison with the traditional cache and the baseline case where no cache is used. We show that the semantic cache has a much better performance than the other two methods. Research supported by Research Grants Council, Hong Kong SAR, China under grant number HKUST6241/00E. M. Nascimento and Y. Theodoridis. 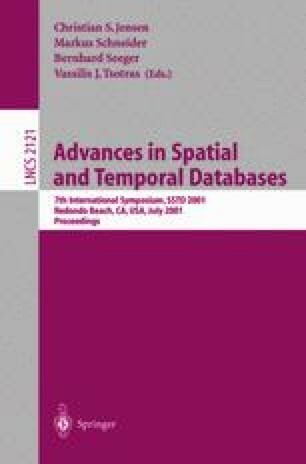 Benchmarking spatial-temporal databases: The gstd software. http://www.cti.gr/RD3/GSTD/. Jonathan Richard Shewchuk. Triangle: A two-dimensional quality mesh generator and delaunay triangulator. http://www.cs.cmu.edu/quake/triangle.html.